Water: can be liquid, gas, ice - different forms, and yet all, water. Apple: made up of the skin, flesh, and core. A clover: three petals make up one stem of clover. I am currently doing a Beth Moore study about the Holy Spirit: Living Beyond Yourself, in which even Beth has made the attempt to explain the Trinity. And while I consider her a master teacher, I have yet to find a way or learn of a way to completely and adequately explain or understand the Trinity. Even still, I fervently believe in the unity of the Father, Son, and Holy Spirit - 3 in 1. Thus, I think I raise the white flag and choose to place the Trinity in the "mystery" category - spiritual things I "get", but can't explain logically. And that's that. 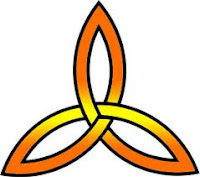 I have watched so many people struggle to define the Trinity, that it makes me wonder. Are we OK with there being a mysterious element to our faith? Maybe it was never meant to explained? Are we cool with NOT knowing everything??? Hmmmmm . . .